Coastal Carolina Community College (CCCC) is a 3,050-student institution with a 98-acre campus located adjacent to NC 53 (Western Boulevard) in Jacksonville, North Carolina. With enrollment projected to increase 140% over the next 20 years, CCCC knew it would quickly outgrow its existing transportation infrastructure without some additional provisions. The campus had three access locations, all of which were along Western Boulevard. Extending Faculty Drive would provide a fourth campus access via Country Club Road on the south side of campus. 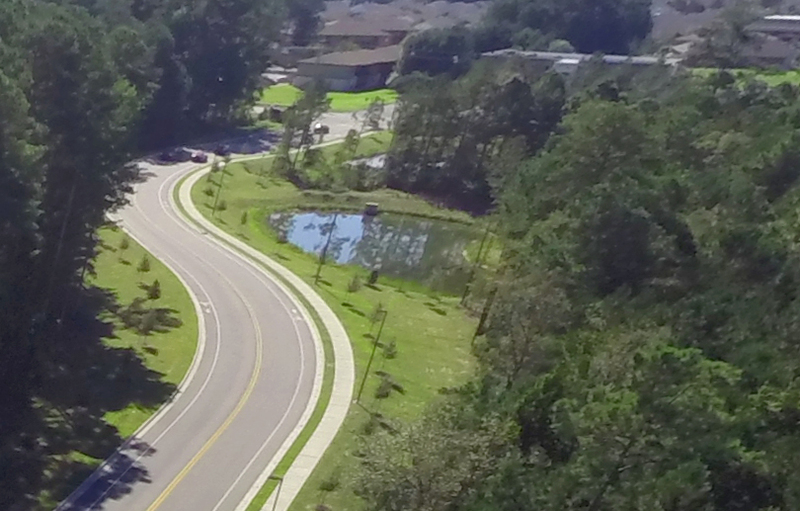 Initially, DAVENPORT provided the City of Jacksonville and NCDOT with a traffic impact analysis and concept designs to determine off-site roadway improvement requirements for the Faculty Drive extension project, as well as for the college’s upcoming master plan. With the results of the analysis confirming the project would significantly improve traffic flow and help accommodate the projected increase in volume, CCCC then selected DAVENPORT to design the Faculty Drive Extension access road. The new roadway includes a roundabout connecting it to the college’s existing network. Accomplished in roundabout design, DAVENPORT is accustomed to designing to NCDOT, MUTCD and FHWA standards, as well as addressing visual appeal. This roundabout features a color scheme, signage and landscaping to coordinate with existing campus aesthetics. The corridor was designed to be pedestrian-friendly, incorporating bike lanes, sidewalks, street lighting, street trees, entrance signage and a large pond. Wet and undesirable soil and poor drainage also complicated the project. DAVENPORT incorporated combinations of undercut, fill and geogrid to overcome these design challenges. The team also designed a shoulder drain system to address groundwater issues that arose during construction. DAVENPORT coordinated the Faculty Drive Extension with CCCC’s adjacent building and parking lot, projects already underway. This maximized efficiency by helping to prevent both design-plan and construction-schedule conflicts. Even with complex features and multiple stakeholders, DAVENPORT completed the Faculty Drive Extension design two months ahead of schedule. 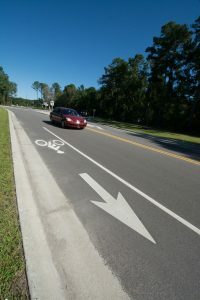 The firm’s relationships with the City of Jacksonville and NCDOT enabled the team to pursue an expedited schedule for the various plan stages. Obtaining agency buy-in upfront and responding quickly to questions helped ensure that target review times were met. DAVENPORT completed the schematic design, design development and construction document phases (25%, 75%, and final plan submittals) with minimal review comments. The firm also provided construction administration, working closely with the North Carolina State Construction Office. DAVENPORT’s comprehensive involvement with this project included transportation impact analysis, concept roadway design, cost estimating, final roadway and sidewalk design, landscaping, street lighting and entrance signage design, grading, drainage design, storm water management, storm water pond design, erosion and sedimentation control, construction documentation, permitting, bidding and construction administration.